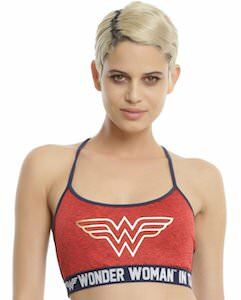 If you like to work out and you like Wonder Woman than this Wonder Woman logo sports bra is perfect for you. Now everytime you go for a workout or a run you will feel a bit more like a true superhero just because of this Wonder Woman sports bra that is also great for when you like to lounge around and want to feel like a lazy superhero. 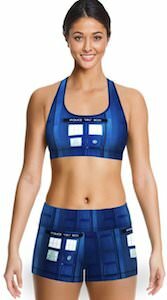 The Wonder Woman sports bra is made from 86% nylon and 14% spandex and is red with the Wonder Woman on the front and the logo and her name on the waistband that is blue and goes all around. 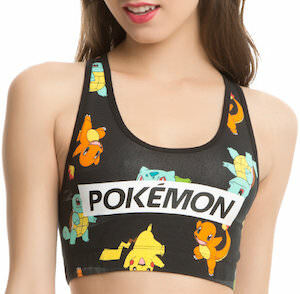 On the back, you can see some cool straps to make it look really cool. So now just pick your size and you are ready to have Wonder Woman close to your heart.